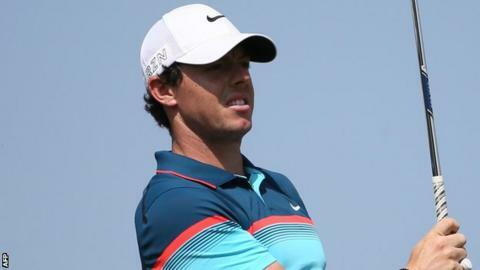 Rory McIlroy coasted to a three-shot victory at the Dubai Desert Classic and was never seriously challenged on the final day in the Emirates. Four ahead overnight, the Northern Irishman, 25, did not need to repeat his first three days' brilliance as a two-under 70 left him on 22 under. His nearest overnight challenger Morten Orum Madsen triple-bogeyed the first as Sweden's Alex Noren (65) took second. Holder Stephen Gallacher (69) was in third place, six shots behind McIlroy. The victory means McIlroy has achieved four wins and three runner-up finishes in his last seven European Tour events. "I played a solid round of golf and did what I needed to do to keep my nose in front," McIlroy said. "I felt like I was a little bit tentative over the first few holes but I guess we've seen what can happen to big leads these last few weeks with Martin (Kaymer) and Charl (Schwartzel) in Abu Dhabi and South Africa. "I was conscious of that and making sure I didn't make any mistakes." Kaymer led by 10 shots early in the final round of the Abu Dhabi Championship last month before his collapse handed victory to Frenchman Gary Stal while South African Schwartel's late slump allowed England's Andy Sullivan to clinch the South African Open a week earlier. McIlroy, whose 2009 triumph at the Dubai event was his first professional victory, birdied the third and despite carding only his second bogey of the tournament at the seventh, remained in firm control at the turn. Former world number one Lee Westwood moved to within four shots of McIlroy after three early birdies but the Englishman's challenge was ended by a bogey at the sixth and a further double bogey at the ninth. McIlroy led by five after producing routine birdie-fours at the 10th and 13th and despite Noren's final-day charge, the world number one never looked like losing the lead. A successful 10-foot par-putt at the penultimate hole kept him three ahead and he avoided any mishaps at the last. McIlroy will head to Dublin on Monday for a High Court date to settle a long-running dispute with his former management company. Kaymer, 13 adrift of McIlroy after round three, moved up the field as a closing 65 left him sharing fourth with Sullivan, Dane Madsen and recent Abu Dhabi Championship winner Stal. Northern Ireland's Graeme McDowell (70) shared eighth spot with England's Robert Rock after both shot closing rounds of 70.